What is included in my first order and why do I need to order a Starter Kit? Your first order will be a Starter Kit that includes a color of your choice, Glossy Gloss and a remover. The kit is $55 plus shipping/handling/tax = $63.37. After you buy the kit the first time, additional colors are $30.99 with shipping/handling/tax. The color is applied in three, thin layers. The gloss is used to seal in the color and hydrate your lips. The remover is used for mistakes and to remove the color at the end of the day. Compared to other brands of "stay put" lipstick, it isn't. Younique's Lipstain is $22 for 4 ML, so $5.50 a ML. Kylie's Lip Kit is $29 for 3.25 ML, so $8.90 a ML. Revlon Colorstay is $8 for 2 ML so $4 a ML. LipSense is $25 for 7.4 ML, that's $3.38 a ML - the most bang for your buck! And, it lasts 4 times longer than a regular tube of lipstick. What is LipSense® and what is in it? A long lasting (up to 18 hours) lipstick that is waterproof, kiss proof, smudge proof, not tested on animals, vegan, GMO free, wax free, gluten free and lead free. It works with a permeable shea gloss which transfers through the color to hydrate while still keeping the color on. Why can't I just wear my own gloss or lip balm with LipSense®? Glosses or lip balms that contain wax (most do) will take off the LipSense® color. The only gloss that will seal in the color and have stay put power, just like the color, is LipSense® gloss. Why do my lips feel tingly when I put on LipSense®? The first time you try LipSense® it can tingle. This is because the lips are dry and not sufficiently moisturized. Those without dry lips do not notice this. The sensation will stop once you have finished the application and applied the moisturizing gloss. After you have used the Gloss for a day or two you will rarely ever experience the tingling again. Dry lips can be caused by repeated use of wax and paraffin based lipsticks, which, by their nature, can cause dry lip tissue. You can eliminate this by conditioning the lips for a few days and not using any wax based products. Once you use the LipSense® and the Gloss on a regular basis the dry lips will be gone forever. I order from SeneGence® as soon as you order (and pay). Then I wait for my shipment from them so I can send your order to you. Apparently shipping is taking an exceedingly long time (lately) so orders are taking awhile to get to me. Currently, orders are shipping out after 12 days, then I have to package and ship to you, which takes another 3-5 days. Be patient, your order is coming! If you don't like your color or the product, you can return it to me with a full refund. LipSense® has a 100% money back guarantee. How do I apply LipSense®? Visit this page to see how to apply your LipSense®. Who makes LipSense® and why can't I just order from them? SeneGence® is a cosmetic company that makes LipSense®, and a lot of other stay put makeup like eyeliner, foundation, blush, etc. You can order any of these items from me, as well, check here for a complete product list. 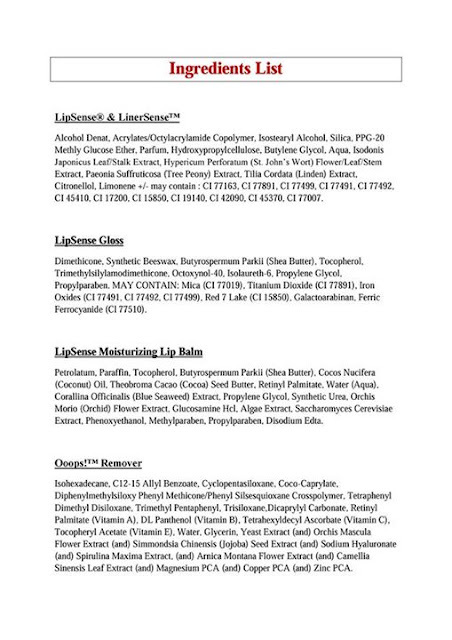 SeneGence's® website is very confusing and you have to have a distributor's ID to order products (which means you have to have my ID or be a distributor yourself). SeneGence® takes a portion of our sales if you order on their site. So, distributors use their own Contact Form for people to place orders. It will notify me that you completed it, and then I will send you a longer order form for you to place an order. I've seen LipSense® on Amazon and Ebay, and some other websites, can I just buy it from there? It is against SeneGence's® policy to sell on secondary sites, so the person you're buying from has no regard for the legal contract they have with the company. Would you buy from someone you can't trust to even uphold their end of a distributor agreement? What does that say about their ethics? You also have no guarantee that you are purchasing legitimate LipSense®, ShadowSense® or any of our SeneGence® products. Buying from a secondary seller voids ANY Money Back Guarantee, so when you get that gorgeous LipSense® and it just doesn't work for you, because it is old or outdated, you can't return it. You have NO way to determine if the products have been tampered with or altered in any way. After you buy it, you have NO recourse. How to tell if a product is fake? It's cheap, it's a different color (even slightly different), people have posted reviews saying that it is fake, the packing looks slightly different, the texture and/or smell are strange, the seal is broken (each LipSense® is sealed before opening).